Hull and East Riding students to enjoy a day in the life of the NHS. Students experience a wide variety of staff roles during a day in the life of the NHS. Hull and East Riding students will be rolling up their sleeves as they get the chance to experience many of the different roles the NHS has to offer in the fourth annual ‘A Day in the Life of the NHS’ event at Hull Royal Infirmary on 12 and 13 November. The interactive learning event, brought together by health and education organisations from across Hull and East Yorkshire, will open up with an address from Commonwealth boxing champion Tommy Coyle. Teams from across the local NHS will demonstrate a set of different scenarios to students in which a whole host of staff play a part. It’s hoped that showing students the wide range of healthcare careers available will inspire students to pursue a career in the NHS, boosting future recruitment of the next generation of NHS staff. Following the success of previous events, this year’s A Day in the Life of the NHS will once again take place over two days, with students from five different schools signed up to take part. Students will enjoy a range of activities throughout the day, brought to them by real-life health staff. In each session, they will get the chance to learn about each role and get advice on the steps they can take to get there. One scenario will incorporate Infection Prevention and Control, with a focus on sepsis and anti- microbial resistance. Other scenarios include showing students the importance of communicating with those in hospital with a learning disability and how A&E staff deal with an emergency situation – a teenage boy who suffers injuries after a motorcycle crash. “It’s important for us to continue looking at the ways we can boost the workforce of the future. A Day in the Life of the NHS is a wonderfully creative way for us to spark interest in young people and help guide those who are thinking about a future career in the NHS. There are so many interesting and rewarding ‘behind- the-scenes’ careers that all have a vital part to play in the care of patients. “Inspiring young people and fuelling their interest in NHS careers is vital in building our workforce of the future. “The Day in the Life event provides young people with the perfect opportunity to speak to our staff and learn more about the different roles and career opportunities available within the NHS. “Our Trust alone employs almost 9,000 people in over 320 different roles including apprenticeships. All of these posts require different levels of experience and qualification so there really is something for everyone. “It is important that as a faculty we play a part in raising awareness of all healthcare professions, which also supports recruitment to our future health workforce. 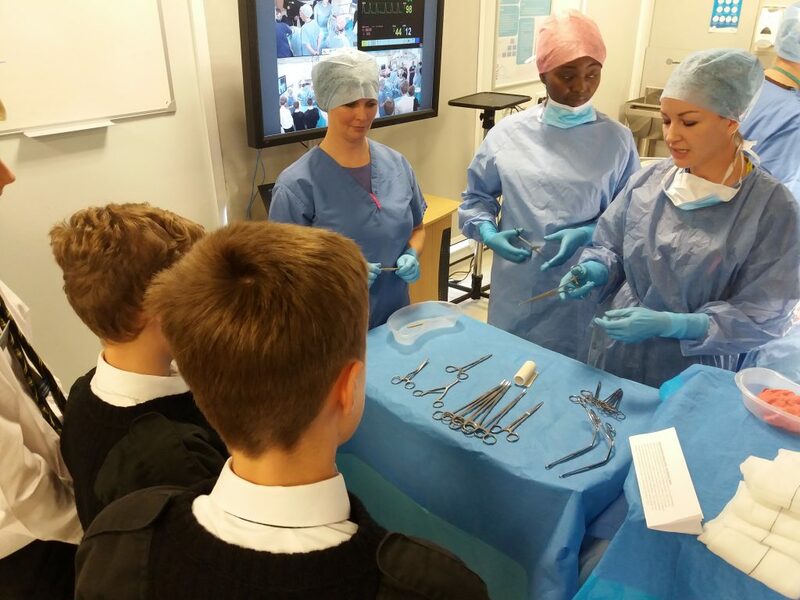 Where students have the opportunity to get involved in scenarios such as an operating theatre; where they are able to examine surgical and anaesthetic equipment, wear surgical hats, mask and gowns, whilst gaining information on different healthcare career paths available, will highlight how health can offer a fulfilling career. Be the first to comment on "Hull and East Riding students to enjoy a day in the life of the NHS."